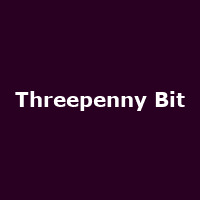 Threepenny Bit are a young and energetic eight-piece concert/ceilidh band who play a lively mix of British folk tunes with a hint of klezmer and glam rock thrown in! Consisting of guitar, fiddle, drums, electric bass, flute, accordion, clarinet and Saxophone, their big, stomping sound will have you dancing all night. The band also have a caller, who shouts out the dance steps for the Ceilidh, guaranteed to have you up on your feet! They released their debut album 'Something' in 2011 followed by second album 'Cartography' in 2013.